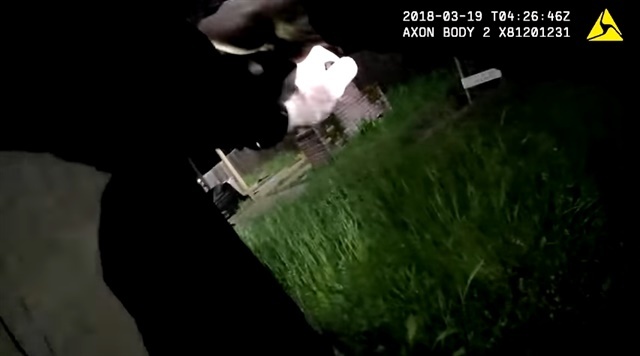 The Sacramento Police Department has released body camera footage capture by systems worn by two officers involved in the fatal shooting of an auto burglary suspect Sunday night. The department says, "Prior to the shooting, the involved officers saw the suspect facing them, advance forward with his arms extended, and holding an object in his hands. At the time of the shooting, the officers believed the suspect was pointing a firearm at them. After an exhaustive search, scene investigators did not locate any firearms. The only items found near the suspect was a cell phone." The incident has led to protests in the city. In the video, the shooting occurs around the 8 minute mark.